When my wife handed me the telephone, saying there was a strange woman wanting to speak to me, I experienced one of those inexplicable insights that occur to all of us from time to time, and which have no satisfactory explanation. ‘Is her name Jude?’ I asked, already knowing the answer. I put the phone down and stood awkwardly, at something of a loss. And yet here she was, six years later, casually inviting me to lunch as if we were old friends confirming a regular appointment. Unlike many of our fellow students, I never felt that Jude was a little crazy. She was rude, frustrating and difficult to talk to for very long, but not crazy. I first noticed her at the back of the lecture theatre where she sat, arms folded, wearing an expression of exaggerated boredom. She was a few years older than most of us on the History degree, and a week or two into our studies I asked her what she’d been doing before coming to university. ‘Why do you need to know?’ she snapped. I was startled by the sharpness of her reply, and explained that I had no motive other than a mild curiosity. ‘East to west, or west to east?’ I asked, in a weak attempt to reciprocate her humour. ‘That’s none of your business,’ she replied, and walked quickly away. It wasn’t just me. Some weeks after that, I overheard Liz or Lisa – I forget her name – ask Jude if she could borrow her notes from a lecture she had missed. ‘You can borrow mine,’ I said, interrupting what I knew from experience would turn into an increasingly scornful tirade. But at other times, she could be polite and charming. Up to a point. My parents drove up to visit me on one occasion and Jude happened to be among the people they met. She listened attentively while they reminisced about their own student days, asked all the right questions and laughed convincingly at all their jokes. Then she asked them their star signs and proceeded to give them a detailed, wholly erroneous and increasingly sarcastic account of their past, present and future lives. Unusual was the right word. Her long auburn hair was often braided into pigtails, and while she typically wore the preferred student uniform of jeans, T-shirt, loose jacket, and trainers, she would occasionally jettison that in favour of an extravagant floral frock or workman’s overalls. She was attractive in a conventional way, but her physical appearance was of no significance to her. At parties, she sat cross-legged in a corner, cigarette in hand, challenging people to seek her out. In conversation, she would make outrageous assertions and then calmly wait, daring people to assess, judge or contradict her. And although Jude had no close friends or romantic attachments, she seemed to have no need of any. 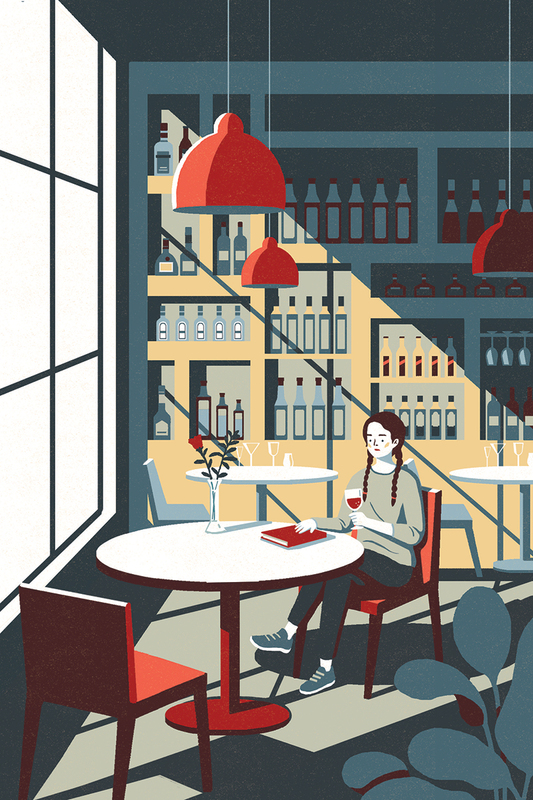 My initial intrigue – after all, I’d come to university as a naive eighteen-year-old in search of the unfamiliar and unexpected – quickly disappeared, and I devoted the next three years to pursuing the pleasures of student life. The superficial attractions of what I had taken to be her radical bohemianism became repetitive and wearisome, and I dismissed her style as hollow, her behaviour as stilted, her feigned indifference to others as unnecessary, and she soon became a minor figure in my brave new world. I never actively avoided her as some did, but on the rare occasions when we did talk to each other I was careful to keep to neutral topics and to ask no questions that could give her a chance to delve into her store of cynical and derisive retorts. By our third and final year, our interaction was largely limited to nods of acknowledgement as we passed in the corridor. When we graduated, I did not bother to seek her out to congratulate her and to wish her well; by that time, I had largely fallen into line with the commonly-held perception of her as a loner or a misfit. But not crazy. Never crazy. I failed to spot her as I walked into the hotel’s restaurant, and only the intervention of a waiter who had been briefed to bring me to her prevented an embarrassing search. Her hair was shorter, she was wearing glasses, and her clothes were fashionably restrained: if I had to guess, I might have said she was a primary school teacher or civil servant. She kissed me lightly on each cheek, and motioned me to sit down at her table, where an open bottle of Chablis sat in its ice bucket. For a few seconds, I had no idea what I was supposed to say or what she expected me to do; as I’d reminded myself on my way to meet her, she was a slight acquaintance from several years ago, and we had little common ground. ‘Dave Cummings?’ I made up a name. So I told her. I told her that after leaving university, I started working as an administrative assistant with the National Trust. I met Sally, who was doing the same kind of work for English Heritage, at a cultural tourism conference and we married two years later. I told her that I was no longer in regular contact with any of our fellow students, and that while I had enjoyed those years, the degree in history had been useful rather than essential for my career. She listened thoughtfully, and maintained a concentrated, and rather intimidating, eye contact throughout. I was about to ask her for the details of her own life when the waiter asked us if we were ready to order. Over lunch, she volunteered little information about herself, answering some of my questions and ignoring others. No, she wasn’t married. Yes, she’d gone back to live in London – a flat in Clapham – but recently she’d been away from home a lot. Did she miss our student days? Not at all. When I asked if she was working, she smiled. I asked her how she’d run into Brian Mills. This time, I failed to conceal my astonishment. So had everyone else. The Opposite of Cat had been published earlier in the year to huge critical acclaim and had already won several of the major literary awards for fiction. Its 400 pages begin with the unexplained disappearance of the Prime Minister’s wife, but as police investigations fail to provide any explanation, a tide of accusations and allegations reflects the divisions and hostilities within the country at large. Gradually, the novel evolves from a thriller about a missing person to an analysis of the state of Britain today. The book had been at the top of the hardback bestseller list for six months and showed no signs of being dislodged. I stared at her across the table, still unable to connect the belligerent student I had known at university with the writer of the most incisive, entertaining and compelling story I had read in years. She leaned back and waited until our plates had been cleared away. I collected my thoughts. I wanted to give an honest answer, and one that demonstrated my attention to literary description. I was by no means knowledgeable about the ins and outs of contemporary fiction, and my reading choices were usually guided by recommendations from others. She smiled at me and when she offered to refill my glass, I placed my hand over it. Was I being insulted or complimented? Harris (who eventually resigns) was for me the most sympathetic character in the book. Struggling to hold both his family and the nation together, he fails in both tasks. When his wife does eventually reappear, it is too late for him: his children have turned against him, blaming him for their mother’s absence, and the country is gearing up for a bitterly-fought general election. Was I really like that? A procrastinator? Hesitant, diffident, incapable of action? Is that how she saw me? I wondered if she was goading me or testing me. I also wondered if she’d said the same thing to others – Brian Mills, for example – for her own amusement. Her ability to derive pleasure from another person’s discomfort was something I remembered well. She went on in the same mocking vein for several minutes. She delivered her observations without pausing, or appearing to reflect on what she was saying, or considering what their impact might be on me – as though they were lines she had rehearsed and was now mechanically reciting. As I listened to her, I was suddenly struck not by the likeness between myself and Nicholas Harris, but between her and Emily Harris, the Prime Minister’s wife – a selfish and unrepentant woman who engineers her own disappearance in order to taunt and humiliate her husband, and who refuses to accept any responsibility for her actions. I realised, with something of a shock, that the physical image I had conjured up of Emily Harris while reading the book was not too different from the woman sitting opposite me. I folded my napkin and laid it on the table. There were many things I could have said to her, but I had no wish to prolong our meeting. ‘You’re not leaving, are you, Michael?’ she asked. As I was walking away, she called to me.